Sorry it took a while, but with the busiest week of the year behind me at work, I am finally rested and ready to give Daredevil #31 another go. As you all know – if you have read the issue (and I assume that you have, or that you at least don’t mind the spoilers), there is plenty of drama in this issue. 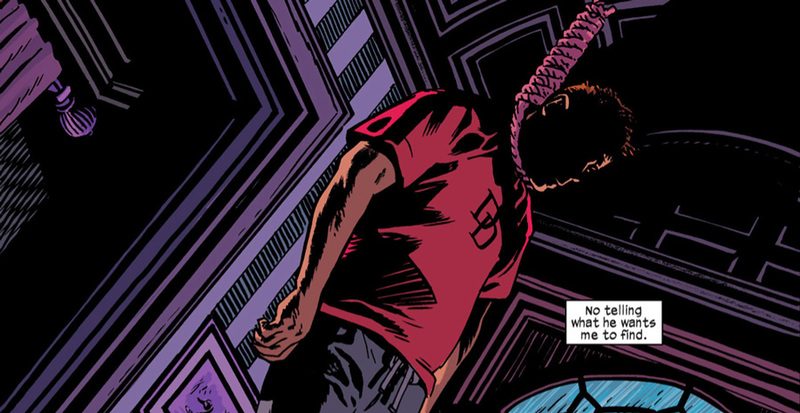 We have an absolutely shocking final page to discuss, as well as Waid’s decision to reference real-world events. The Trayvon Martin case (or is it technically the George Zimmerman case?) made the news even where I live (Sweden, for those who didn’t know), though it obviously received less coverage than in the United States. Still, it didn’t take me more than a panel’s worth of the in-story trial coverage to recognize where Mark Waid had drawn his inspiration for it. While this issue, like most of this volume of Daredevil, has been very well-received, there were quite a few people (on message boards and elsewhere) who admitted to groaning a bit, at least initially, at what was perceived as a lack of subtlety. I’d be willing to agree with this, to some extent. Making the victim of the shooting out to be a saint, and his shooter correspondingly villainous may not be subtle, but I would argue that what happens after that is. I realize that some people apparently mentally checked out the minute they realized there was a real-world reference at play, but in my opinion, they would have done so prematurely. The monthly comic book format is limited in how much information can be contained in a single issue, and in order to get the ball rolling quickly, and in this case, move on to the issue’s main story, taking shortcuts is sometimes required. This is how I view the decision paint victim and shooter as polar opposites. It can be done swiftly (literally within the scope of the one panel seen above on the right), and allows us to move on to other things. It also has the advantage of playing into the bigger plot that’s brewing with the Sons of the Serpent. But what is interesting is Matt’s relatively level-headed reaction to the verdict. While personally dismayed by the outcome, he acknowledges the undeniable skill of the defense team, and doesn’t actually put that much blame on the jurors. He realizes the difference between what is “the right thing to do” from a moral perspective, and what can be proven from a legal standpoint. And this shouldn’t really be all that surprising since this goes to the very heart of Matt Murdock as a character and is the whole reason he dresses up in a devil costume in his spare time. Matt the lawyer is fully aware of the limitations of the legal system, and can make better sense of them than someone without his many years of education and professional experience. It is also by distinguishing between “legal right” and “moral right” that he creates room for what it is he does as Daredevil. Daredevil operates at the fringes of the law, in many ways even completely outside of it. At the same time, Daredevil’s kind of justice cannot replace the more narrowly defined legal justice. He knows this, and accepts it. What he does as Daredevil can never be officially sanctioned. You could write an entire essay about the dichotomy of Matt the Lawyer and Daredevil the Vigilante, but I think Daredevil #31, far from lacking in subtlety, very skillfully cuts to the core of this conflict. At the end of the day, and taken as a whole, I see nothing “preachy” about this issue. On the contrary, if you want to insert real world references into a story, this is not a bad way to do it, by simply using a real world case as a starting template and then doing somethings completely different with those basic building blocks. By bringing the Jester and his well-known M.O. into the picture, you also get the chance to highlight some of the potential differences between the real world and the Marvel Universe. So, on the very last page we see someone who must be Foggy dangling from a rope, and it appears that he has hanged himself. And may I just take this opportunity to remind everyone that in this context, the correct form of the past tense is “hanged,” not “hung.” My apologies for using such an intense scene to throw in a grammar lesson, but there you go. Every time an issue comes out, I usually go check out the comic book message boards and read other people’s reviews, and I’m always surprised by the kinds of strange ways people interpret certain things. I have seen more than one person who very clearly didn’t get that it wasn’t the real D.A. who exposed the jurors, just as I have seen more than one person who clearly thinks that Foggy has willingly taken his own life, despite the very obvious ties to the Jester (which is how Matt finds him to begin with). Yes, even with the suicide note, this scene has supervillain setup written all over it. That’s not to say that there wouldn’t be a conceivable reason for Foggy to want to kill himself, based on some heat of the moment impulse. Between the events of that morning, as depicted earlier in the issue, and the scene on the last page, he may have been given some particularly bad news by his doctor, or even by the Jester, or someone else posing as his doctor (hey, who knows?). Ewing’s sarcoma is obviously a very nasty kind of cancer with poor chances of survival if it has metastasized. And, even survival might come at the cost of a limb in some cases (as is the case with many tumors of the bone) or very radical surgery. However, like I said, this all smells of the Jester. If Foggy had wanted to end his own life, why go across town to do it? To an address associated with the Jester, no less? You could argue that killing Foggy is a bad idea, period. That he is such an integral part of the Daredevil cast and so important to the main character that you would be doing permanent harm to the health of the title itself. Killing off Karen remains controversial to this day, and she was a character who was missing from the cast for years at a time. To use Mark Waid’s own toy box analogy, breaking the Foggy toy may not be such a great idea. Killing Foggy would cut short the current storyline which sees him dealing with cancer. Waid has explicitly stated that he sees this as an interesting way to explore the two characters by having them lean on each other and this would truly be a very weird end to that story. Since Marvel is actually working with the American Cancer Society, I have a very hard time consolidating this kind of ending to Foggy’s story with a semi-realistic take on dealing with cancer. Besides, Waid has also hinted that he’d like to see Foggy’s struggle with cancer play out for a while. This kind of scene may be shocking, but is not something that we as readers are unfamiliar with. Dramatic cliffhangers are commonplace and things are very often not what they seem. There was also a new interview with Mark Waid in the Washington Post last week, which featured unlettered preview art that shed some additional, albeit inconclusive, light on this scene. I won’t reference it here, but everyone is perfectly free to comment on it in the comment section. If you haven’t read the interview and choose not to, then stay clear of the comments. I think I’m going to end here, for now, and get on with writing my review for Daredevil: Dark Nights #3 and #4 so I can get that up too. Comment away, everyone! What did you think of this issue and what do you think happened with Foggy? I suspect it is a mannequin or some other setup to shock Matt. After Foggy’s bravery speech earlier in the issue, there is no way that he’d take his own life much less (as you mentioned) leave the hospital to go to a previously unknown address to hang himself in a house advertised as belonging to the Jester’s alternate identity. Especially since he needed a nurse to help him down the hall and into bed. A factual correction: it’s GEORGE Zimmerman, not Carl. I agree that it can’t really be Foggy in the final scene. Thanks, Steven! A certain Carl Zimmer is a favorite science writer of mine, so that’s how the “Carl” probable found its way into that sentence. 😉 I’ve corrected it. @Elizabeth: You know, I didn’t think of it possibly being a mannequin, but that would explain Matt’s apparent behavior in that DD #32 preview. Which of course raises the question of how much (or little) the Jester knows about how Matt’s senses work. If the shock value is delivered primarily through visual means it wouldn’t be much of a shock to Matt who would be more likely to recognize his friend by his scent in this kind of scenario. Or by his heartbeat if he wasn’t dead yet. Also, congratulations on your moment of Daredevil stardom/being threatened by a Jester-fueled mob! Second also … is it just me, or was the foreman of the jury (at least, the guy delivering their verdict) a pretty good match to the “John Powers” picture? And I didn’t see anyone in the box who was a good visual match to the guy who complained to Matt that he wasn’t included in the juror list (though there was another face on the juror list who looked sort of like that guy–in which case, why was he complaining?). Granted, we didn’t see the whole box, but I can’t shake the feeling that Matt just went haring off to Powers’ address and left a fake juror with the people Powers had just endangered. I was wondering if Foggy’s nurse could have been the same guy shown in the photo of the non-juror with Jester’s name, but another look ended that theory. Yeah Foggy’s obviously not dead. If at a future point Marvel doesn’t let Mark Waid do some sort of Ant Man series it is just a tragedy. This “Sons of Serpent” plot is shaping up wonderfully. “The cancer is the only thing keeping you alive right now!” was great. The panel of Kirsten grabbing Matt by the arm has, probably, the most awesomely goofy face I’ve ever seen on Murdock. Now the Trayvon/Zimmerman reference. To me it was borderline, and I can easily see how its rubbing some people the wrong way. Some just don’t want real world issues and politics in their fiction. It could have been a more subtle reference, but Mr. Waid chose to make no illusions as to his views about the case (views I happen to share). I didn’t have an issue with it other than when reading it, I immediately thought “yeah thats gonna tick off some folks.” But then the plot really kicked in and pet ants showed up and I didn’t care anymore. I was also on the fence about the Trayvon case reference. With Matt being a lawyer I guess it seemed like a very easy and natural real world reference. I liked how it tied into the Sons of the Serpent story line and highlighted continued race problems, and how easily differences in opinion can explode into full scale rioting. And as usual Christine you pointed out some very good points about the duel side of Matt’s life as a lawyer and vigilantly, which I thought was really cool. But the problem I had was what Robert pointed out, Waid made no attempt to hide his own politics and put them into the title. I really don’t have a problem with comics dealing with real world issues or even specific incidents, in fact I usually enjoy it when they make you think and give you a new perspective on things. But there is a difference between bringing up issues or referencing real world cases and being shoved the authors views on them. Waid really walked the fence with this one. Im glad it was only a page in length and Waid did attempt to at least present both sides of the case. All in all it did take me a bit out of the comic at the beginning and I had to grumble a bit to get past it, but I think it served the issue well and transitioned quickly into a fun drama filled issue that both tied into the overarching story well and presented a little commentary on the state of society as a whole, which I enjoy (as long as its nuanced). And come on the Jester is back to being cool and fun! And I had my doubts that that was possible. Waid has built up enough credit with me that I can easily overlook the minor compliant that I had. Oh and who needs Thor when you have flying ants?! Loving that Hank Pym is continuing to be such a strong supporting character in the series. Oh and last but not least, Samnee is continuing to hit it out of the park, and the colors are oh so rich and fit oh so well! Still a great time to be a DD fan!